I found some lovely bright pink twill suiting type fabric (little stretch) in the clearance section, so I picked that up for my “bright maxi skirt”. 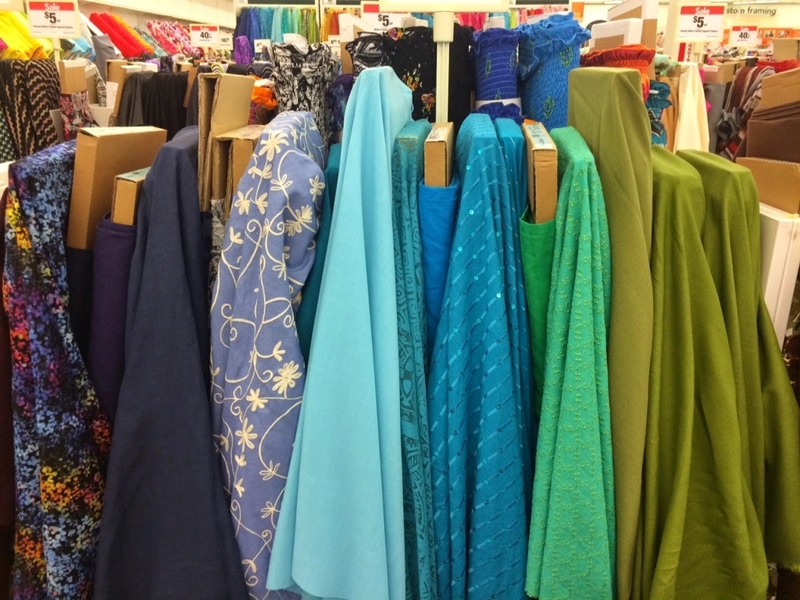 This was just about all of my store’s linen selection. I was hoping for some more muted tones, but they just didn’t have any. I wanted maybe something with a print or a color with deep undertones so dirt wouldn’t show as much, but there just wasn’t anything like that. The linen on the left was on sale for $10 a yard and the purple and green linens were on sale for $5 a yard. I was torn between making a cheaper, brighter skirt that I may be harder to match with (purple or green are not common in my wardrobe) or splurging on two yards of the gorgeous natural linen with navy blue embroidery. I asked Willa her opinion and she gave me a “that repulses my very soul” face when she saw the purple and green, soooo I splurged on what will be about a $25 skirt. I’m hoping to get a lot of use out of it, though. 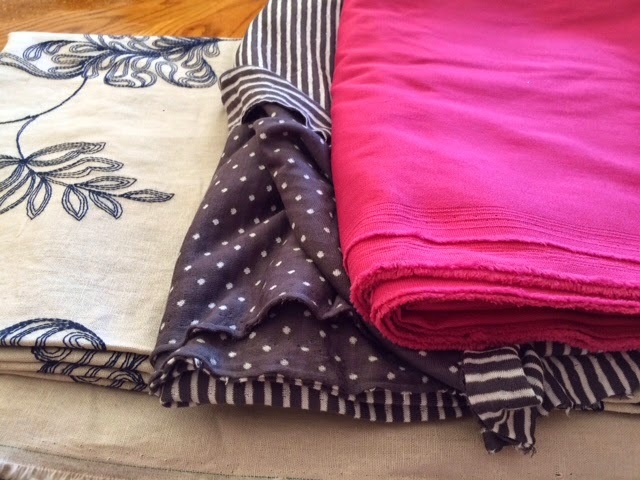 Here are the three fabrics I ended up with: Linen for church skirt, double sided knit for a tunic, and pink twill for a maxi skirt. We also went to Hobby Lobby hoping they might have some denim since that was the only fabric I was lacking, but alas, their fabric selection was even dinkier. 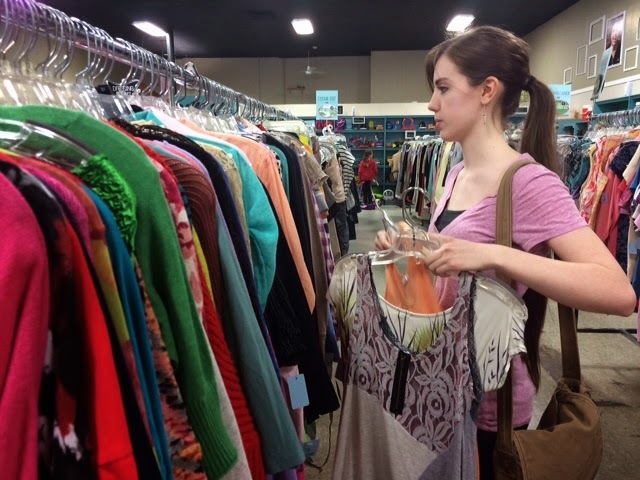 Willa and I each grabbed an armload of things to try on. She came away with 5 or 6 cute tops! I tried on a lot of things, but asking myself “Would I actually wear this more than once?” brought my final choices to just a few items. We had to swing by Walmart on the way home for some items for the family and stopped by their clothing section. I used to shop there for most of my clothes but now I hardly ever need to go in there, so I shop elsewhere. I was pleasantly surprised to see lots of maxi skirts and cute, relatively modest dresses for sale! They were about $15-$20, so if they weren’t out of my size I probably would have gotten one or two. 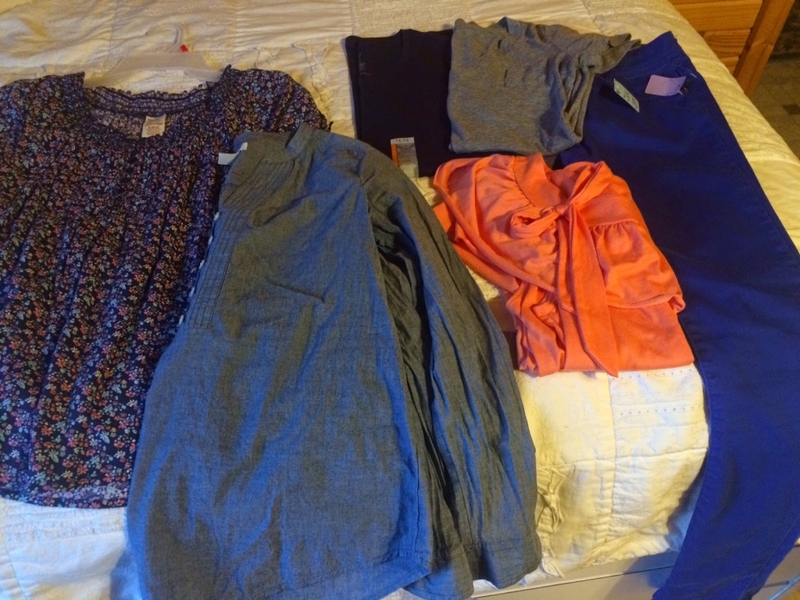 This is my final haul for the day: Two tunics, two casual shirts, one nice-casual shirt, and a pair of blue skinny jeans. Monday // 71* // Errand running in my new tunic from Walmart. Fabulous pose curtesy of McDonalds espresso machine finally being fixed. It was an almost-successful day of shopping. 😉 It can be really difficult to reconcile our ideals in our head with what’s actually available/within our reach, but it’s a skill that can be learned and carries over into every area of our lives. I still have quite a few gaps and “needs” in my wardrobe, so I’ll keep y’all updated as I work on it! Hey Olivia thanks for sharing this process with us!! Would love to see how the piece you are sewing turn out! Have to laugh at your sister's "that repulses my very soul" face. My own dear sister has used that face with me a thousand times. I love the tunic with the jeans. This was pretty helpful!!! We're moving out of a big city and into a small town (yaaaay!) that has a limited amount of places to shop, this will remind me that not finding a piece isn't the end of the world. Now if I only I had your sewing skills!! Even though it's a patterned linen, I think you'll definitely get a lot of use out of it. The base color is a great neutral and I could see you pairing a lot of different T-shirt colors with it. On the double-sided knit – are you planning to make a reversible top with that? Your espresso comment made me laugh! I have a friend who begs me to drink coffee whenever I'm talking to her while I'm tired, because she loves how loopy it makes me… haha! I drink it all the time, but when I'm already tired before a dose of caffeine, it does strange things to me, haha! Your sister is so pretty… she looks a lot like you! Haha :). I love bright jeans as well! I think that lovely royal blue color's fantastic and I also love red and yellow. I completely relate to your difficulty, but I think you made great choices! 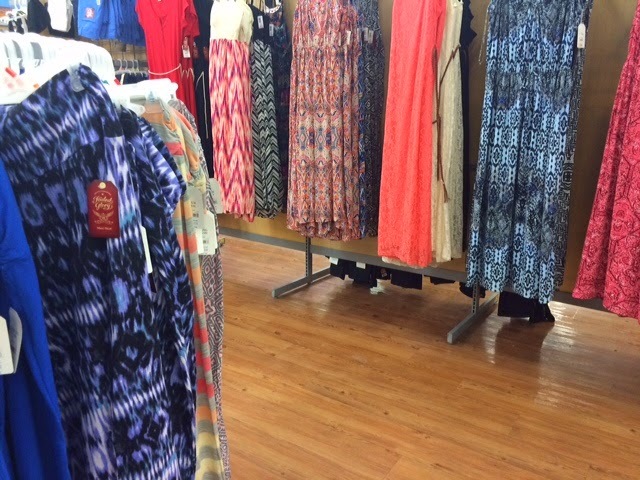 Lately I found some great maxis at the Walmart where I live (NJ) I've gotten 3 so far and they're so nice and inexpensive! I love following this blog! It inspires me and helps me to make choices so I can feel good about what I wear! Your new floral tunic is so cute! I love how you described Willa's look as "that repulses my very soul"! That is too funny! I've really loved all these posts about how you are filling out and keeping up your wardrobe. It helps it not seem so daunting and actually feel pretty do-able. I love that you can keep your head and make wise decisions, because wardrobe maintenance is not cut-and-dry in any way. Thanks for the inspiring posts! I don't do a whole lot of sewing; I'm a senior in high school involved in theatre, speech and debate, youth group, service organisations, and AP classes, and I've just hit crunch time with my college search, so free time isn't really a thing in my world. I did, however, make time for one very special sewing project: my prom dress. I used coupons and sales to pick up about a dozen yards of satin and chiffon for only about $50, which is a good half to a third of what most girls end up spending on their prom dresses. 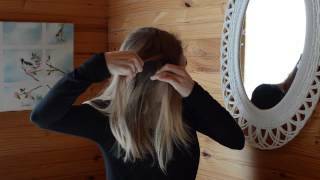 I'm making my own accessories and hairpiece, so no cost there. The only thing I'm still looking for is shoes (if anyone has an idea on how to acquire a reasonably cheap pair of flats, your advice is appreciated!) Even though I don't have a lot of time I do still enjoy sewing. Thanks for the inspiration! Love that floral tunic!! I'm really interested to know how you'll sew the double sided knit tunic so there aren't any raw edges. Ah yes the difficulty of finding fabric. 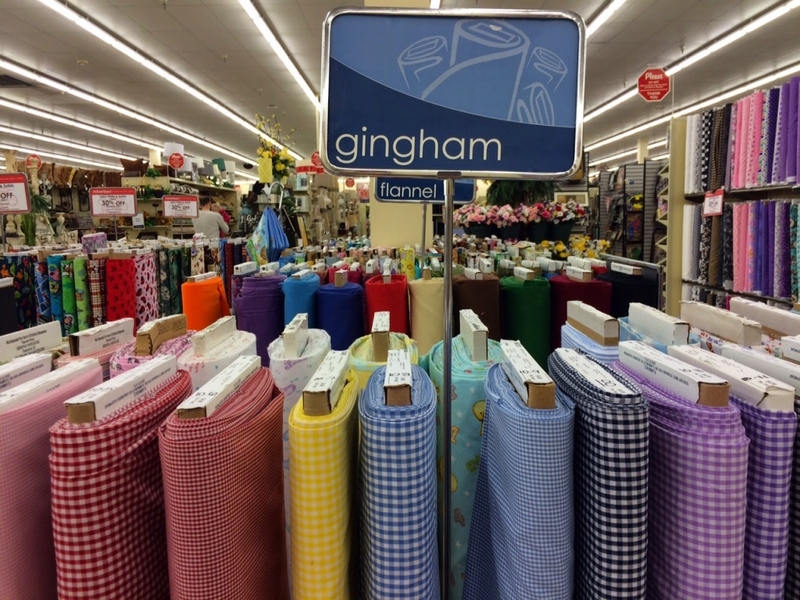 My fabric store is a bit like that. 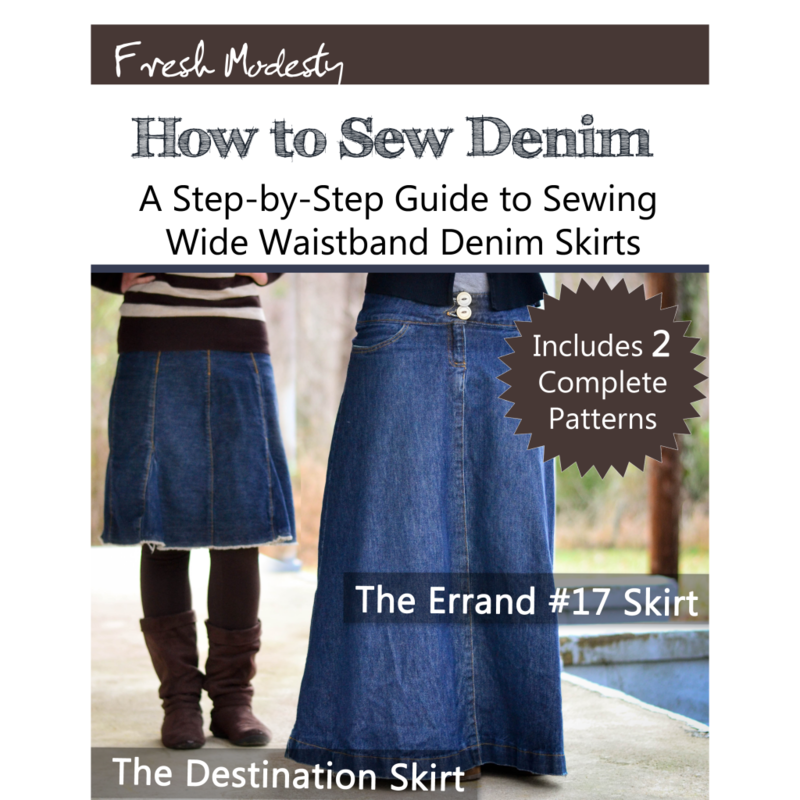 At the moment I need to get some fabric to make a winter skirt to go with a denim jacket. The trouble is I don't know what I'm really looking for. I looked in 3 second hand shop but didn't find any possibilities. I also am tempted to bur something just because it is modest, even if I don't need it. It's a way of saying well done to them. Btw: I have been treading your blog for a while, Olivia. I just didn't have a google account before. 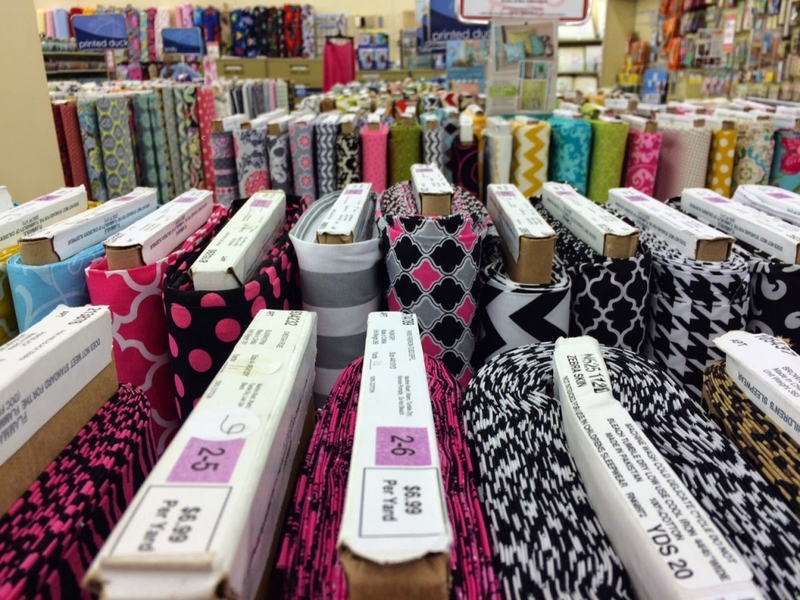 Buying fabric is exciting! Keep us posted on the finished projects! Would love to see pics. Just curious, but since your Dad likes you girls to wear long tops to cover your rear when you wear jeans, when you bend over with this one on, wouldn't it not cover your rear? It barely covers it standing up straight. Btw, your hair do is super cute on you! 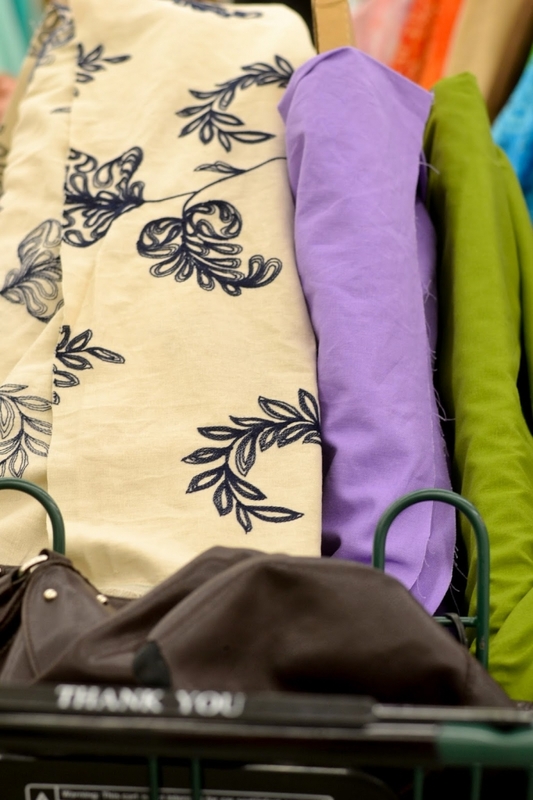 I know you buy a lot of your clothing online, but have you considered buying fabric online? It may be a way of sourcing what you REALLY want at a reasonable price. Economically speaking, if you use the "original price divided by number of times I automatically reach for it to wear" because you are totally happy with it equation, you may find the cost acceptable. Equate three hours of petrol against postage and you're away laughing on a fast camel. I know this is a random question, Olivia, but i have just been wondering….. what is your fav. kind of music to listen to, and if you don't have a fav. what music do you simply enjoy? Do you have any modest skirt/dress patterns you are willing to share for free?? I just wanted to ask how you think wearing jeans is really modest? I do not find them modest in the least. I find it discouraging that you would even consider dressing in such clothes as a modest fashion blogger. So many girls look up to you! I realize everyone has different standards and that we are all free to express them but please consider that young girls are looking up to you and many who used to dress modestly are quickly going down to dressing very immodestly. Please do not take offence at my comment. I am just simply wanted to bring this to your attention. It looks like you found some great finds! Walmart does have some lovely Maxi skirts right now. :) I really want to get one.